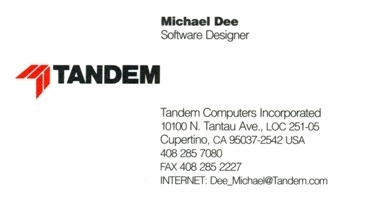 I was hired by Tandem Computers immediately after obtaining my degree in 1988. 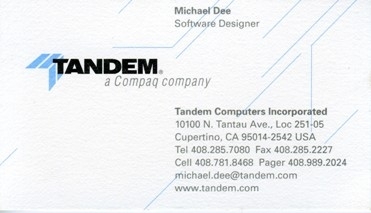 Tandem was purchased by Compaq in 1997. HP merged with Compaq in 2002. · Oral/Written Communication: Excellent technical writing skills. Clear writing and speaking at the appropriate detail level for the specific audience. Good listener. · Customer Perspective: Constant focus on the customers’ needs, usage, and perspective to create quality products. · Quick Learner: Very quick to become productive on new products and/or work environments with minimal mentoring or formal training. Willing and able to learn new methods and skills. · Leading Teams: Organize, lead, and manage team activities to deliver final products on time and budget. · Streamlining Development: Identify opportunities to streamline development process and lead change. · Product Lifecycle: Manage lifecycle for optimal profitability and customer needs. · Product Longevity: Squeezing new life and value out of old products. · U.S. Citizen. Current DoD Secret clearance, SSBI on file. · Eighteen years in software development with increasing responsibilities in a variety of user applications (primarily data acquisition control systems, firmware control/display and database internals/utility/storage interfaces), in C, C++, and TAL languages, in Linux, UNIX, Microsoft Windows, and Tandem NSK development environments. Experienced in product requirements, quick prototyping, sizing, design, validation, problem analysis, process improvement, SW-CMM, internal/external documentation, inspections, version control, release process, sustaining, major enhancements, managing junior developers, coordination with offshore organizations, shared code products, versioning, interoperability, disk and tape handling, and multi-organization builds. · Sustained, added major enhancements, Y2K support, and new features to Backup/Restore (B/R) and SQL/MP common code NonStop Kernel (NSK) products. Trained/delegated development tasks to foreign contractors. Wrote internal and external specifications, historical changes document, design proposals, and code inspection documents. Worked with field analysts to resolve customer issues. Noteworthy customers: NASDAQ, RaboBank, and Target. B/R and SQL/MP products involved launching and/or communicating with multiple processes including SQL catalog managers, parsers, command interpreters, tape and disk processes, tape catalogues, the NSK file system, event logs, and terminal I/O processes. I/O was waited and non-waited. Access to resources ranged from read-only to exclusive. Some operations were performed within transactions. Network flexibility inherent in NSK systems required support for the B/R process, SQL catalog manager, individual SQL disk partitions, tape drives, and tape catalogs to be independently located. They could be on the same system, or distributed on different systems throughout the network. Product builds included objects from 20 or more other products. These were also distributed throughout the network. · Upon taking leadership of B/R, changed development effort from extended research to action by revising an original algorithm to search existing partitions on disk for current DDL instead of overwriting with potentially obsolete DDL from Backup tape. Eliminated 98% of related customer complaints in the next deliverable. Change allowed Target Corporation to proceed with planned data base maintenance strategy. · Championed, designed, and implemented a new user option allowing recovery of multiple partitions in parallel while eliminating costly I/O duplication. Systematically tested and documented customer archive/recovery scenarios in increasingly complex environments. The result was published as a company wide best-practices document and included in the product user manual. · Led contractors to enhance B/R SQL/MP file size handling from 32 to 64 bits. Despite beginning several months late due to critical sustaining priorities, this 9-month project was delivered to QA on schedule. There have been no related customer problems in 2 years. Received recognition award. · Influenced most functional areas of architecture as the SQL/MP consultant on the architecture team for the next generation of B/R initially supporting SQL/MX. Focused on customer needs and usage, practical approach, long-term issues for multiple object types, and expandability. Received recognition award. · Reestablished the NSK thread of an ongoing NT platform development effort. The NT implementation was cancelled when Compaq acquired Tandem. The NSK thread returned to production as SQL/MX. All code was in C++ using Microsoft Visual C++, MKS tool Kit (primarily AWK), and ClearCase tools. · Wrote and maintained the internal SQL/MX Development Documents web pages in HTML. · Member of the Software Process Improvement Team focusing on SW-CMM efforts and development environment issues. · Medically and HAZMAT trained as a member of Emergency Response Team. Received recognition award. · Designed and implemented I/O controller windows for a UNIX based Motif style GUI used internally. Product was the interface for SCSI disk controller developers to download embedded code and perform integrated testing and debugging from anywhere on campus. Emulated existing lab debuggers to eliminate user retraining. Written using Tcl, Tk Toolkit and Expect for use on Sun Sparc workstation. Window elements included standard buttons and radio buttons, drop-down menus, single line entry fields, windows with horizontal and vertical scroll bars to view debugger output sessions, formatted output fields displaying register values and memory contents, options for preferred numbering base, base conversions, and format-checked input fields to modify register and memory values. · Developed Tandem Maintenance and Diagnostic System (TMDS) monitor which identified hardware status changes, performed fault isolation, created log events, and forwarded alarms for dial-outs to the customer support center. Diagnostic data was obtained through interfaces to embedded maintenance subsystem firmware and the NSK file system. Primary task involved creating monitor support for low-end systems where fault analysis functionality never existed. Code was written in c and TAL. · Resolved high-profile field issues as a software representative on the latest high-end system task force. · Joined Tandem to assume responsibility for the Remote Console Process (RCP). RCP was a screen-oriented user interface that allowed users to monitor and control any Tandem system from any 6530 terminals or terminal emulator. RCP emulated the functionality of the system maintenance subsystem with frequent requirement and design changes driven by system hardware modifications. Code was written in c language. A high percentage was ported directly from maintenance subsystem firmware for use on the NSK platform. · Added data simulation to the RCP Power/Environment screens greatly increasing test coverage. Designed/implemented trace functionality to solve non-reproducible field problems. Wrote external specification to document existing product. Wrote RCP Offshore Training Plan, trained offshore developers.